If you live outside of Michigan and have picked up a DUI charge here, one of the more important challenges you’re going to have to overcome is finding the right lawyer. In this article, I want to address that without saying, in a self-serving way, “hire me.” Because I limit my DUI practice to the Greater-Detroit area (meaning cases brought in Oakland, Macomb, Wayne and a few of the surrounding counties), my intention is to provide some guidance for any out-of-state resident in need of a Michigan DUI lawyer. Much of this also applies to Michigan residents who live far away from their city of arrest. To be clear, if you have been or expect to be charged with a Michigan OWI (Operating While Intoxicated) offense, it’s probably a good idea to look for a lawyer who concentrates in this field, and not some general practice or even general criminal lawyer, or one from the “other side” of the state, wherever that may be. Because of the number of DUI cases I handle, I am usually representing several out-of-state resident clients facing a Michigan DUI charge at any given time. In my 27-plus years, I have handled so many of these cases that my staff and I know exactly how to work them out in just 1 court appearance. Ditto for clients from “up north” or the west side of the state who have picked up a DUI here, in the Metropolitan Detroit area. 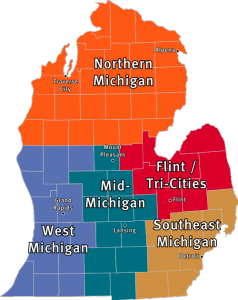 One of the most important aspects of handling a drunk driving case for an out-of-state resident (or someone who lives in Michigan, but far away) is to try and wrap the whole thing up in 1 day (meaning 1 trip back to Michigan, or to the Detroit area for the client), or, in those courts where that’s not possible, to limit the client’s inconvenience to no more than 2 trips back. This is one of the main reasons I suggest that a person in this situation look for a lawyer who concentrates his or her work in the DUI field, because it’s more likely that such a lawyer will have made these types of arrangements before over some lawyer who occasionally “does” DUI cases as part of a larger practice. Obviously, the farther a person has to travel, the more inconvenient this becomes, and travel expenses can be an issue, as well. While I cannot recall a single time when my office has not been able to reduce multiple court dates down into one (or two, at most) for a distant client, the courts do not have a mechanism for this. In other words, despite the fact that distant or out-of-state DUI cases are not as rare as pink unicorns, the courts will generally leave it to the lawyer to work everything out with the various departments (clerk’s office, probation department, and Judge’s office) in order to consolidate the process. Imagine that your driver’s license was like a membership card to a health club. Now, imagine that there are 4 different health clubs in the country: Club A, Club B, Club C, and Club D. Assume that they all have the policy of honoring each other’s memberships. Thus, a person who belongs to Club A can go work out in Club B, C or D anytime they’re open, and vice-versa. If Treadmill Tina, who is a member of Club A is working out one day at Club C and violates one of its rules to not use a treadmill for more than an hour, and the consequence for that violation is not being able to use the treadmill again for 7 days, that penalty is unique to Club C. In other words, Club C can surely prevent Tina from using its treadmill, but it cannot stop her from going back to Club A the very next day and using the treadmill. No “guest” club can change the terms of a person’s membership with their home club, but it can control how that membership may be used (or not) at its own establishments. The same holds true for driver’s licenses, except that…. Just about every state will penalize you for a DUI obtained in another state. The same holds true even for things like speeding tickets. This is where things get messy. When you pick up a DUI in a different state, your home state will still usually suspend or restrict your license pursuant to it’s own laws. Michigan, for example, has no crime named “DUI.” That’s just a term everyone uses. In Michigan, we have 3 levels of drunk driving offenses, from least to most serious : Impaired Driving (OWVI), Operating While Intoxicated (OWI), Operating While Intoxicated with a BAC of .17 or more (High BAC). Beyond those, we have OWVI and OWI 2nd offense (High BAC can only be charged in a 1st offense case), and OWVI and OWI 3rd (felony) offense. When a Michigan resident is convicted of a DUI offense somewhere else, Michigan doesn’t follow that state’s licensing laws, but instead imposes the sanction for the closest corresponding offense on its books. What this means for someone who lives out of state is that it is possible that even if he or she is convicted of the least serious 1st offense OWVI charge, for which a Michigan resident would only have his or her license restricted (NOT suspended) for 90 days, it is possible that the home state will suspend it completely, and for longer. In some states, any DUI pretty much nets a 6 month driver’s license suspension. Thus, while Michigan will have restricted the privilege of that person to drive here for 90 days, the fact that his or her home state completely suspended his or her license means the person can’t drive anywhere, including here. Let’s look at this the other way around: assume that non-resident Party Pete is convicted of High BAC here in Michigan. Under our law, a Michigan resident will not be able to drive at all for 45 days and then can only drive for the next 10 and 1/2 months on a restricted license and using an ignition interlock. Now, assume that Pete’s state has no corresponding High BAC or “superdrunk” law, and that as a result of his Michigan conviction, it simply suspends his license for 6 months, after which time his full license is returned. Once his home state gives his full license back, Pete can drive in any state, at any time, for any reason – except Michigan. Michigan, under it’s law, will have imposed a restriction on Pete’s ability to drive. This means that until a year has passed, if Pete comes into Michigan, even driving on his “full” license from his home state, he can only do so if he’s operating a vehicle equipped with an ignition interlock unit AND if he is driving for one of the specified reasons allowed by Michigan’s restricted license. The good news is that, for most people, none of this matters. Hell, most people getting a DUI in another state never want to go back there anyway. However, some people have business here in Michigan, so the delicate balance between the 2 states’ licensing actions will be important. Fortunately, at least for my clients, the other part of my practice is driver’s license restoration, so I can at least provide an accurate and complete explanation of the Michigan side of things right away. This can be complicated stuff, but because my staff and I work with these issues all day, every day, we the Michigan side of it cold. For someone looking to hire a lawyer in another state for a DUI charge, that kind of certainty is a necessity. When lawyers speak in disclaimers rather than absolutes, and frame things in terms of “it should,” or “usually” or any kind of language that is not clear and definitive, you should take note, take precautions and probably take off. In the context of something like a 1st offense DUI, where you aren’t going to jail anyway, it’s what things like what will and won’t happen to your license that is going to matter, not avoiding the jail sentence you were never going to get anyway. At least in the Metro-Detroit area, where I practice, and with only 1 possible exception for some cases pending in the 48th district court in Bloomfield Hills, you are NOT going to jail in a 1st offense DUI case. Period. Stop wasting your time, or, heaven forbid, your money, on that non-issue. Even in most 2nd offense cases, jail can be avoided completely, especially for an out-of-state client. This is an important consideration because anyone wasting space on jail talk is either incredibly ignorant or otherwise just another member of the fear-based marketing crowd. Either way, that kind of focus not only misplaced, it also means the person is NOT directing proper attention to those things that will affect you, like what happens to your license and what kinds of classes or counseling could be required of you. Avoiding as much of that as possible should be the focus of your lawyer’s efforts. In many of my other DUI articles, and within the relevant sub-parts of the DUI section of my website, I cover those issues, and the reader is strongly urged to browse through them and understand how and why those are THE most important aspects of any Michigan DUI case. Each case is unique, not just because of where the person lives, but also where the case is pending. Add in the facts of the case itself, and you have a lot of ingredients in the recipe. I often end my articles by urging the reader to read as much as he or she can, and then call around. Here, that’s really important. You can learn a lot from a quick phone call to a lawyer’s office. If your call goes to voicemail, for example, it means there is no full-time staff. If all the staff does is take a message, well, then you know they’re not going to be of much help, either. In my office, whoever answers the phone can answer most, if not all of your questions right then and there. You’ll never get voicemail at my office during regular hours (M-F, 8:30 a.m. until 5:00 p.m.). If you’re facing a DUI anywhere in the Tri-County, Detroit area and looking to hire a lawyer, I can help. Explore my blog and my website. Look around, then call around and compare. When you’re ready, give us a ring. All of my consultations are done over the phone, right when you call. We can be reached at (586) 465-1980, and are here to help.